Madhya Pradesh registered record turnout of 74.85% on November 28 - an increase of about 3% compared to 2013. The turnout increased across the six regions of the state. People queued up in large numbers to participate in the festival of democracy since wee hours of the morning. A total of 194 seats witnessed an increase in turnout and 36 witnessed a decrease. The high turnout has given hope to the Congress, which has been out of power for 15 years. Its leaders have started making claims about their gharwapsi. However, the analysis below shows they shouldn’t be partying too soon. Shift in Indian politics from primarily bipolar to multi-cornered contests. This time in MP, at least four to five parties apart from the main players like SP, BSP, AAP, GGP, SAPAKS, were contesting fiercely, motivating their cadre to vote. The rule of thumb is that an increase in turnout generally means that people are unhappy with the incumbent and want to show them the door. Higher turnout usually results in a change of government and vice-a-versa. Let’s test this. I analyzed the voting pattern of 17 big states (sending more than five MPs to parliament) which went to polls along with and / or after the Lok Sabha elections of 2014. 12 out of these states registered an increase in turnout as shown below. Interestingly, 11 of them witnessed change of guard, change in the composition of the government. So, the trend is pretty strong. However, the trend hasn’t been working in Madhya Pradesh. 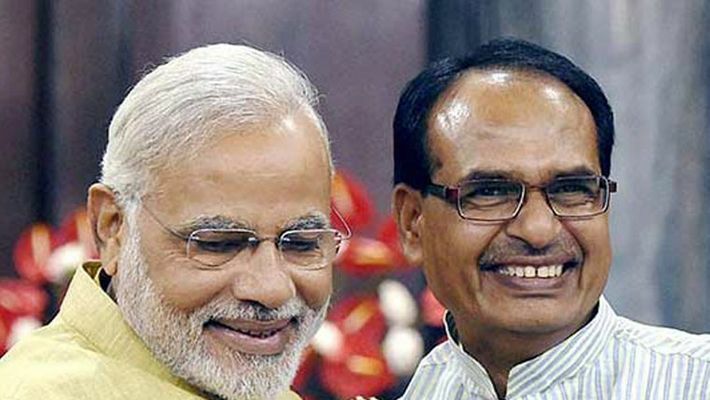 Shivraj Singh Chouhan returned to power in 2008 and 2013 despite higher turnout compared to previous elections. The BJP came to power in Madhya Pradesh in 2003 defeating Congress when turnout increased from 60.2% in 1998 to 67.3%. This was in line with the trend. However, in subsequent elections despite an increase in turnout from 67.3% (in 2003) to 69.8% (in 2008) and to 72.1% (in 2013), the incumbent BJP has managed to retain power each time. Not only has it been winning the state, despite higher turnout, the BJP has also been consolidating its position as the number one party in Madhya Pradesh. Its vote share has witnessed an increase from 42.5% in 2003 to 44.9% in 2013. Not only has it been consolidating its position, the BJP does well in regions which register higher turnout. The BJP recorded higher vote share in regions MalwaTribal, Malwa North and Mahakoshal where turnout was higher than state average. In Mahakoshal, BJP’s recorded vote share of 45.7%, Malwa Tribal 45.8% and Malwa North 51.8% against state average of 44.9%. In regions - Chambal and Vindhya Pradesh - where turnout was lower than state average in 2013, party recorded vote share of 37.9% and 39.1% respectively, lower than state average. Shivraj Chouhan has developed a core and loyal vote bank of women in the state. His popular schemes like Ladli Laxmi, Kanyadaan / Nikash, Prasuti Sahayta Yojana have positioned Shivraj as a champion of woman rights and empowerment. Over the years due to increase in literacy levels and awareness levels, the confident Indian woman is making independent voting choices and not merely following the advice of their fathers, husbands, brothers. Female turnout growth has been higher than male for past few elections in MP. While male turnout has increased by 1%, female by 3% in 2018. In 2013 while turnout was almost flat, women had increased by 4%. While male votes increased by 20 lakhs, female votes by 30 lakhs. The difference between BJP and Congress was 29 lakh votes in 2013. In this context, this increase of 30 lakhs is very important. The proportion of women votes in total votes polled increased from 46% in 2013 to 47% in 2018. Female support for BJP was 2% higher than men in 2013, 46% versus 44%. This increase of 30 lakh votes from females could work in favour of Chouhan as it is his solid vote bank nurtured over the years. Two schemes of central government, PMAYG and Ujjwala have further solidified this vote block in favour of the BJP. MP is the best-performing state in India under both these schemes bringing smiles to more than 60 lakh women and their families. Congress in its manifesto mentioned that it will bar RSS shakhas in government buildings and also revoke the order that allows government employees to attend RSS sessions. This didn’t go down well with the cadre which provides organization support to the BJP candidates during elections. The poor and downtrodden have also reportedly voted in large numbers for BJP on account of the Mukhyamantri JanKalyan Yojana (Sambal) which aims to take care of their needs from their birth till the death. More than two crore people have registered under the scheme which is perhaps the largest social welfare scheme in the world. We need to wait till December 11, but the voter may have already blessed Chouhan with a fourth consecutive term.